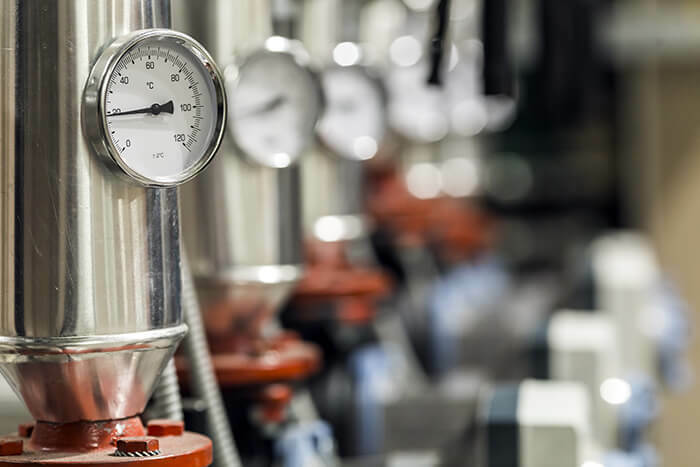 The proper operation of your facility’s boiler depends on upon the support of the systems connecting to it. Systems including the boiler room air supply, flue gas system exhaust, power distribution grid, fuel delivery system, and the hot water distribution system. However, most importantly, boiler rooms need proper air intake. The starting point in a combustion system is a supply of fresh air. Your boiler must also have an adequate supply. If not, it will cease to operate efficiently. Consequently creating a safety hazard as well. It is important that a skilled and knowledgeable HVAC technician analyze your systems and apply the formula to create the proper boiler room air supply. The following equations help determine the amount of air required for any boiler room. *HP refers to the total maximum boiler HP located in the boiler room. Furthermore, your HVAC tech will also examine the size of the fresh air inlet openings and their location. Your system requires a minimum of two permanent air supply openings in the outer walls of the boiler room. Ideally, located at opposite ends of the boiler room and no higher than seven feet above the floor. This practice promotes fresh air mixing in, ensures the cooling of the boilers and tempering of outside air before entering the burner for combustion. Lastly, the air inlets need weather protection that will not get clogged or dirty, which inhibits airflow. 1. Each boiler needs its own fresh air ducting and exhaust stack. 2. For boilers that directly connected to fresh outside air, the ducts must be inspected every three months. 3. The technician must size the ductwork to a maximum pressure drop at the maximum flow of 0.05″wc. 4. The fresh air supply duct should have an electric, hot water, or steam heater to temper cold outside air. 5. Never use direct ducted outside air if the ductwork uses low emissions with flue gas recirculation. In conclusion, making sure your HVAC system employs proper boiler room air intake may seem like confusing. You can trust The Severn Group to calculate your needs, therefore formulating the best solution for your facility. Contact us today for a system evaluation. Our team has many ears experience and extensive HVAC knowledge. All of our technicians are licensed, certified, and reputable. In addition, we are familiar with local building and safety codes.